I came across this video of a frustrated ink cartridge customer. He explains very well what we have know for a long time. It is one of the reasons we at Laser Technology do not work on inkjet printers. Please watch this entertaining video and then if you feel like getting rid of your inkjet printer and replacing it with a laser printer give us a call at 502-222-1788 Laser Printer are much less to operate and much less frustrating. 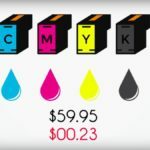 If you own an inkjet printer you may feel like ending the life of your printer much like Gregory Austin McConnell.